Natural launched Vitamineral in 1952. By doing so Natural became the first company to produce a special vitaminised mineral mix for racing pigeons. Vitamineral won the confidence of Belgian pigeon fanciers in no time as it meant a breakthrough in the feeding habits of the racing pigeon. Natural has constantly improved the composition of Vitamineral. 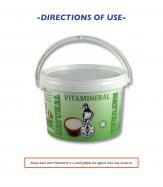 Vitamineral contains all the minerals necessary for a balanced diet. In addition to essential minerals, Vitamineral contains vitamins A, D and E, which are required for the assimilation of these minerals. These vitamins have a positive influence on the growth of the youngsters and the fertility. Vitamineral is a product that pigeons need all year round. Vitamineral should therefore always be present in the pigeon loft. The pigeons will only eat it out of real physiological need. There will be marked consumption when they return from a race and during breeding and moulting. The breeders ingest up to 650 mg of calcium per day when they nourish their youngsters. Vitamineral accelerates the pigeons growth and enhances their resistance.